Nagios XI – Bulk Host Cloning and Import Wizard – New Video Available Now! 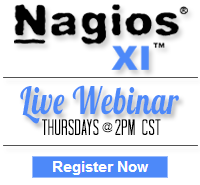 If you missed my post from March 2, 2012 on how to clone a host along with its services in Nagios XI, now is the time to revisit this topic. There is a new video available that shows you how to use this amazing tool. Sometimes it can be a daunting task to set up a monitoring system, especially when you have hundreds of machines that you are trying to monitor, but Nagios makes it simple. The Bulk Host Cloning and Import Wizard is easy to use and allows you to clone a host that has been already set up, according to your specifications, and then copy this “template host” into many other hosts that you want to monitor in the same manner. For example, if you have 500 devices that you need monitored and you want them all monitored in the same manner, all you need to do is set up the first one. Once that is done, you can clone that template via the Bulk Host Import Wizard into the other 499 hosts so that they will be set up in the exact same manner. This will save you a lot of time and effort! Note: If you watched my presentation (“Bulk Management Of Host And Services In Nagios XI“) during the Nagios World Conference 2012, you probably remember that in the past, you couldn’t clone a host, unless you had at least one service selected. This is changed in the new version of Bulk Host Cloning and Import Wizard as per customer requests. Thank you for your feedback! Now, you can even clone hosts, with no services. Category: Nagios XI and Wizards. Closed Tags: Addons, Bulk Host Cloning, Bulk Host Import, Configuration Wizards, Import Wizard, Nagios Tools, Nagios Wizard, nagios xi.